About one decade ago, Oliver Wahlstrom had taken perhaps his most famous shot in hockey. Thanks to a puck-scooping, cradling and whirling sleight-of-hand at TD Garden during a Mini 1-On-1 event, a 9-year-old Wahlstrom wound up riding a viral video all the way through the hockey water cooler world and even to the set of a network morning talk show. YouTube counts quickly shot into the millions, and strangers still feel comfortable telling him their own stories about watching the video clip all those years ago. 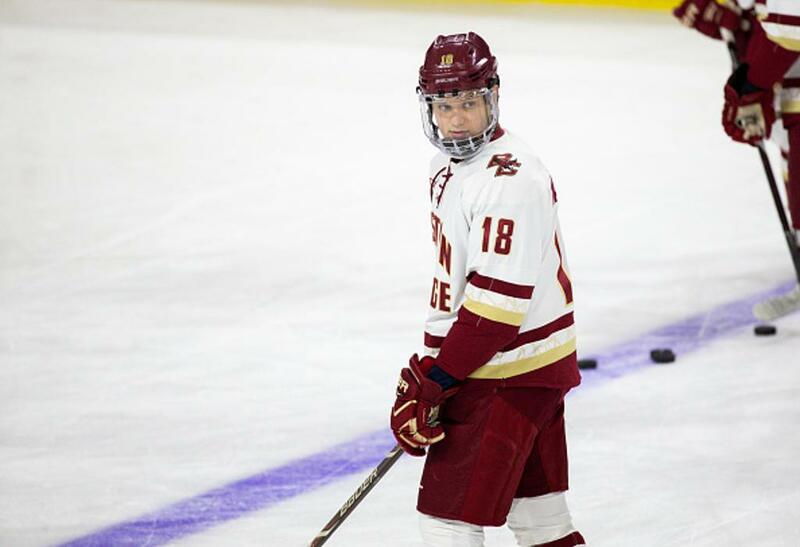 Since then, the Boston College freshman has been building a world-class resume on more than just fancy goals. Prior to BC, he played for USA Hockey’s National Team Development Program. To kick off this calendar year, he earned a silver medal at the IIHF World Junior Championship, and, this past summer, the New York Islanders made him the No. 11 overall pick in the entry draft. Not surprisingly, a lot of this success traces back to his shot. We recently caught up with Wahlstrom to offer his Grade A shooting advice. If you can force a goalie to so much as lift a leg he or she doesn’t want to lift, you’re going to gain an advantage. Even better if you can pull them off posts or open the wickets. In addition to changing the angle a goalie has to cover in terms of a release point, Wahlstrom is also a proponent of changing his angle in relation to the net. Some self-directed shooting practices, not unlike any other kind of workout, can be a service, or disservice, to the effort. Spending every gym workout on your biceps isn’t particularly helpful over the long haul in the same way only shooting with one drill isn’t going to help your scoring game over the longterm. The quote, “You miss 100% of the shots you don’t take” is attributed to Wayne Gretzky, and Wahlstrom buys the logic. If he were given the chance in front of a group of youth hockey players, Wahlstrom, who certainly knows how important goal-scoring has been to his past, present and future career, has some sound advice to even the most motivated shooter.